Finally finished one of four short time-lapse videos featuring the watercolored Easter Cards I did for my family this year! Hope you’ll hop on over and take a gander. Now that all the Birthdays have come and gone, it’s finally time to put this little series up here! It was a wonderful challenge, coming up with four cards that interacted this year. There was originally going to be 5, but, well… I settled at four. If you like what you see, I’ve got cut out variations of each of these creatures up on my RedBubble Shop as stickers, iPhone cases and a variety of other unique gifts. Each piece was drawn using brush and India ink, then finished up and formatted using Adobe Photoshop. Additionally, each card had some fun hand done font inside wishing each family member the very best on their special day. With any luck, I’ll have these available as a 4 or 8 pack set of blank stationary as soon as I get my Store Envy shop up and running! See? Still Doing Things and Stuff! Just a little example of some of the work I’ve finished in recent history. I’ll have more work up soon including my latest promotional piece, “Ichabod”. My goodness, it has been awhile! I haven’t forgotten about posting artwork online, I promise! I’ve been terribly busy as of late, however, and haven’t produced anything worth posting about. I’m working to fix that, and have been working away at several long term projects recently. I have a handful of books I’m working at and planning, and have started another side project under a different name that I’m playing a little close to home. Other wise, i’ve been working. A lot. 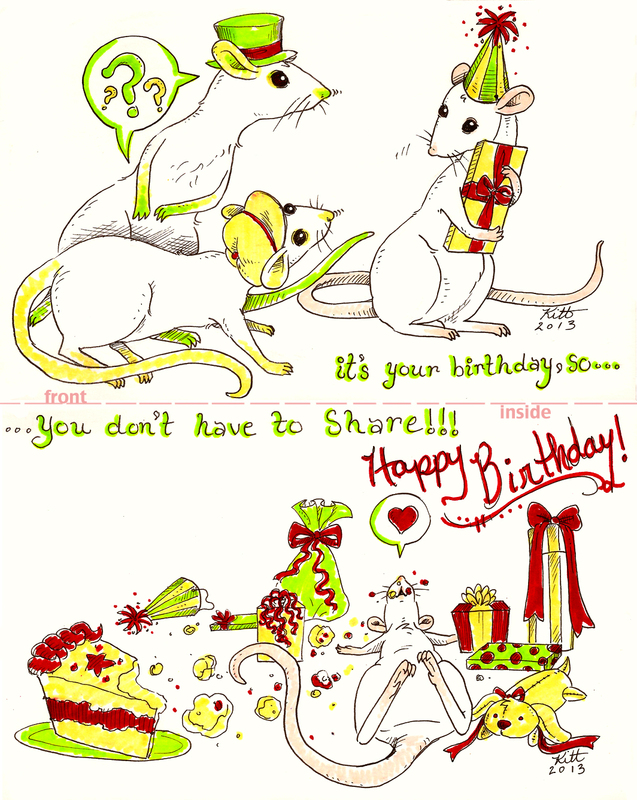 A very dear friend of mine loves her rats, so it seemed fitting to make her an adorable card featuring them. As usual, the colors are a little odd (thank you scanner) but the message comes across well enough. Enjoy! And just like that, the series is completed and ready to go. 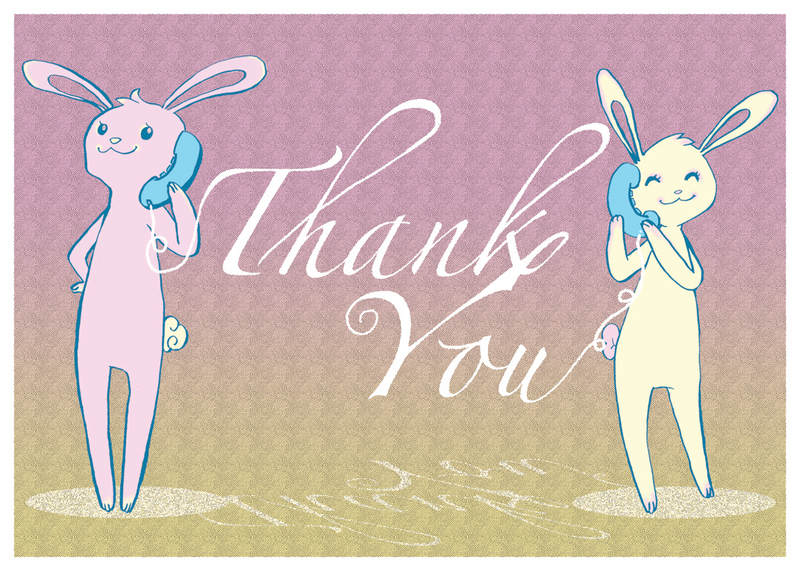 I’m a little sad to be finished with this fun mini series of cards, since I enjoyed working on them as much as I did. I’ve really done my best this time around, and I feel it comes through clearly. Thanks for the Phone Call!! At last!! My series is complete! All five “Thank You Cards” are done and ready for mocking up at long last, so now it’s off to the printers to get that part done. I’ll show you the finished work once it’s done, but for now I’m excited to move onto my next task! Star Trek movie pack, here I come!